Knowledge expertise and execution capabilities in telecommunications and networks arena, which form the core of Smart City infrastructure and operations, effectively positions HFCL as a Master System Integrator, playing a crucial role in crafting and optimizing Smart City solutions. HFCL believes that for any city to evolve as a Smart City, it has to be Safe to start with. Following a comprehensive solutions approach towards designing and developing advanced technology systems and solutions, HFCL strives to deliver Safer Cities to citizens. Homeland Security – Civilian Safety form the core of HFCL’s Smart City strategy. 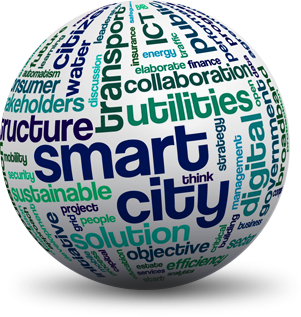 HFCL’s offerings in the Safe & Smart City domain include key core solutions like Communication/IT/Telecom infrastructure, Data Centre, Disaster Recovery and Management, Security, Surveillance, Traffic Management and Citizen/Mobile Applications.For other important modules in the Smart City arena, such as Power, Water, Waste and other utility managements, HFCL partners with reputed organizations having requisite expertise and experience. Having delivered large scale complex projects, coupled with a rich experience of working with various State and Central Government customers and institutions, as well as with medium and large private Indian enterprises, HFCL is well positioned on the confluence of public and private enterprises to competitively deliver on Smart City projects in India. Every Indian city is unique in itself and these cities collectively define the uniqueness of India, with no two cities having similar footprint or characteristics. HFCL takes upon itself the daunting challenge to offer customized network solutions for these varied civilian agglomerations, which vary from large congested urban metros surrounded by sprawling suburban localities to ancient agglomerations, to modern new towns to thinly populated hill and desert towns having population spread over distant spaces. Network connectivity for Smart City ranges from microwave and Wi-Fi solutions servicing heavily congested by-lanes of old towns, to optimized last mile connectivity for leased bandwidth from broadband operators in highly cable networked cities, to dedicated-owned Optical Fiber Cable and Hybrid networks for green field developments. Our offerings are highly customized to comprehensively address unique requirements of varied Indian Cities. We believe a combination or a hybrid model is necessary to design and implement an optimal, cost effective and efficient network. 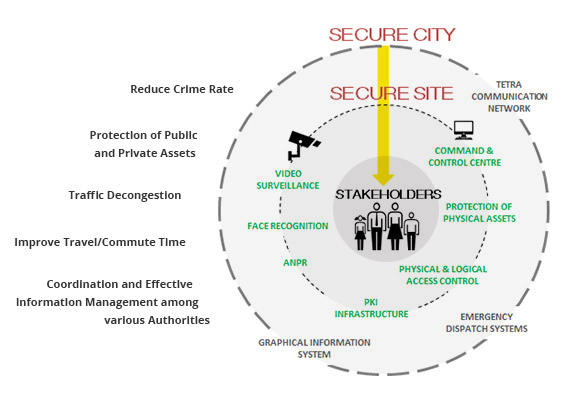 Safe City as a concept has been adopted by many Indian cities and has evolved tremendously over the past few years. Safe City Solutions which were primarily designed for public safety, security and protection of assets, are increasingly designed to include additional intelligent systems and services, thereby becoming the first avatar of the Smart Cities. Even in full blown smart city concepts, safety and security systems are extremely critical and play a crucial role in fulfilling the key objective of making the cities safer for all inhabitants and stake holders. HFCL engineers are not only experts in such system installations and integration, but also have been instrumental in crafting customized and diversified solutions like City Surveillance Systems, Data and Disaster Recovery Centers, Command and Control Centers, Response Management Systems, Mobile Surveillance Vehicle, Automatic Number Plate Recognition System (ANPR) and Red Light Violation Detection (RLVD) System to maintain smooth flow of traffic and imposing Motor Vehicle Rules efficiently for safe commute. All these mentioned systems help in analysis of events and incidents in real time, leading to quick decision and coordination through incident management and investigative analysis available over dashboard, which in turn help in early first response action on ground through Police/Medical staff/Riot Control/Bomb Disposal etc. Increasing mobility, resulting in larger number and type of vehicles treading Indian roads is posing significant challenges for civic authorities to monitor and manage Urban and Highway traffic flows and congestions, and at the same time, address safety and security aspects associated with them (road safety, theft, etc.). HFCL offerings are targeted towards addressing these everyday issues of civil life, thereby extending a safer and secure environment to the population on move. 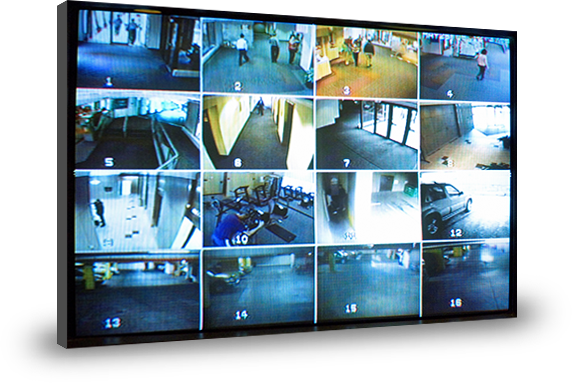 Video Management Software (VMS) plays a vital role in today’s security and surveillance scenario. Data captured and stored through VMS are analyzed for forensic purposes. Situational analytics are implemented over the VMS for more efficient and directional data capture. 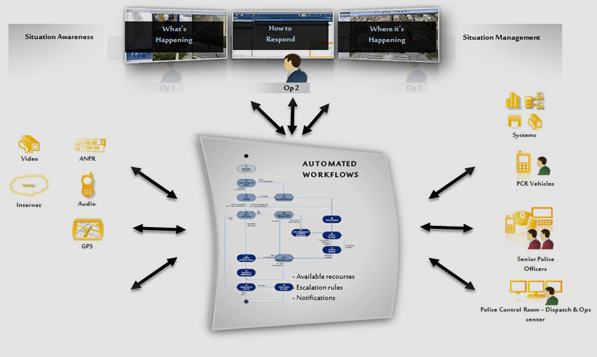 Command, Control, Communications, Computers, and Intelligence (C4I) is a highly flexible and scalable Command and Control solution for monitoring, management and control of remote video, audio and alarm streams in an all IP environment. Its objective is to centralize all distributed security systems and information for fast reaction times. System modules such as Operator/Administrative Workstation, IP Video Wall, Video Management System, Detection & Tracking services, Live Image Analytics, integrated with Analog/Digital Cameras over wired or wireless networks, provide high quality, feature-rich, robust and secure video surveillance outputs, enabling faster in-time response. HFCL, through a modular approach offers customized scalable solutions with built in securities and redundancies for optimum performance. 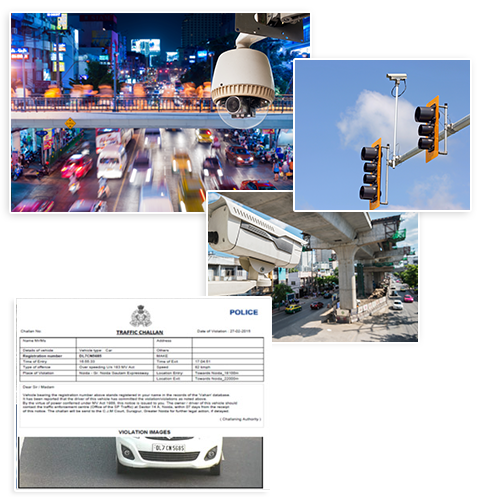 Such systems are ideal for police forces, border control authorities, government departments, traffic management departments, security companies and private corporations seeking comprehensive video surveillance solutions.